In recent years the Russian economy has developed at a high rate, registering 6-7% growth every year, which is much higher than the average growth rate in the world. In terms of GDP calculated in U.S. dollars, it has grown from $260 billion in 2000 to $985 billion in 2006. This year our GDP is set to top the $1.2 trillion mark. Per capital GDP at the current exchange rate increased from about $3,000 in 2003 to $7,000 in 2006, and to about $12,000 according to purchasing power parity. Industrial output increased by 6.6% in January-September 2007, with the processing industry making the biggest contribution to growth. The success of the Russian economy did not go unnoticed by foreign investors. In the first half of 2007, the net flow of foreign investments into Russia exceeded $60 billion, an increase of 150% compared to the first half of last year. Foreign direct investments increased by 50% to some $25 billion in the first half of the year. The performance of the stock market is similarly impressive. Between 2000 and 2006 the capitalization of the Russian stock market increased more than 12-fold equaling the annual GDP in 2006. In terms of stock market capitalization, Russia ranks 18th in the world and eighth in Europe. The IPOs of Russian companies have been growing: in the first half of 2007 the volume of IPOs increased by 150% compared to the same period in 2006. Thus, the stock market is emerging as an instrument for attracting long-term investments into the real sector of the Russian economy. The balanced economic and monetary policy of recent years has given the Russian economy a good "strength margin." Huge gold and currency reserves (more than $400 billion), the growing Stabilization Fund (more than $140 billion as of October 1), the low level of the government debt, and the budget surplus (7.4% of GDP in 2006 and 4.8% of GDP in 2007) provide a safety net that will ensure sustained development of the Russian economy even in the event of external upheavals, such as a drop in oil prices or the currently observed worldwide decline of liquidity. To be sure, the performance of the Russian economy is not only attributable to the favorable situation in the world markets but above all to the economic policy recently pursued, which ensured political and economic stability and strengthened the market institutions. I would like to stress the importance of the continuity of economic policy, which emphasizes institutional change, market transformations as well as the formation of a system of development institutions, which provide a catalyst for attracting long-term private investments to the real sector of the Russian economy. Among the more tangible proof of the continuity of the economic course is the adoption of some long-term strategic documents. This year the federal budget, for the first time, determined government revenues and expenditures three years ahead (including 2010). In November and December the government will consider the Concept of Long-Term Social and Economic Development of the Russian Federation to 2020. The strategic documents already adopted or to be adopted shortly set a clear course of economic policy for the years to come. What is this course? The government remains unreservedly committed to market transformations. Improving the investment climate and bringing down the barriers that impede free enterprise remain the strategic areas of the ministry's activity. It has to be noted that there will be no sweeping reforms like in the 1990s and in the early 2000s. Nevertheless, the targeted reforms currently underway in the areas of corporate law, taxation, and the judicial system are no less important because they are aimed at changing the institutional environment in a qualitative way. Some of the most important problems that call for serious institutional transformations have to do, in our opinion, with the effectiveness of government control and regulation, and with social policy. Creating clear-cut and transparent mechanisms of the interaction between the state and business, effective mechanisms of delivering public services, a transparent mechanism of government procurement and coherent administrative regulations are all key institutions that contribute to a favorable business environment, including the development of small businesses. Also important is a transparent and understandable mechanism of private capital investment, including foreign investment in strategic sectors of the Russian economy. Combating corruption is another goal of institutional reforms. Identifying the powers of government bodies that generate corruption and screening legislation for corruption is the basis of the programs that will be adopted and implemented in each governmental body and region of the Russian Federation. The social sphere is another major area in need of serious institutional transformation. Reforms are needed across a whole spectrum of issues, including education, public health and social security. In addition to the above mentioned areas of institutional reform, one could name dozens of other individual problems on which we are working and will continue to work. I would like to stress once again that a favorable business environment is a necessary condition to ensure sustained social and economic development. That is why the improvement of economic institutions has been and will remain our key task. To achieve the goal of accelerated development, it is necessary to create special instruments that stimulate the development of infrastructure and high technology areas. These instruments, known as development institutions, have been created in Russia in recent years. The first is the Investment Fund, which supports infrastructure projects as well as projects of nationwide significance. The budget will earmark more than 450 billion rubles ($18 billion) for these purposes in the period before 2010. The Investment Fund is a powerful catalyst for the inflow of private investment. Under the projects already approved one ruble of government investments is matched by three to five rubles in private investments as part of public-private partnership. - special port economic zones. Concession agreements are another important development institution which offer one of the most effective models of interaction between business and the state. Federal tenders have been announced for the first four concession projects worth a total of 203.8 billion rubles ($8 billion). The recent years have seen positive trends in bilateral trade. In 2006, the Russian-U.S. trade increased by 41% on 2005 to $15.3 billion, according to Russian statistics. The U.S. is Russia's eighth largest trading partner, accounting for about 3% of Russia's foreign trade. From the results of 2006, the U.S. is the sixth largest foreign investor in Russia in terms of accumulated investments. Unlike most other countries, the largest part of U.S. investments (about 60%) is direct investments. American direct investments in Russia are mainly concentrated in the production sector (about 75%, according to American data). However, it is obvious that American companies have not fully tapped the investment potential of our market. One restraining factor is the absence of a bilateral agreement on capital investment protection and incentives. The U.S. is the only large economy with which Russia does not have such an agreement. We expect Russian-American trade and economic relations to increase in the coming years. This will be aided by the expected accession of Russia into the WTO. Russia's membership in that organization is one of the most effective instruments for consolidating the positions of American exporters in our market. Because of international obligations, Russia will assume, in the framework of the WTO, that the instrument will also guarantee a transparent and predictable legal environment for the activities of American companies, an environment that meets international standards. Here is an example of how the mere prospect of Russia's accession into the WTO improves the situation in the Russian market. The negotiating process has given a powerful impetus to the fight against violations of intellectual property rights. Illegal production facilities are being shut down, controls are tightened and legislation is improved. Elvira Nabiullina, a Russian economist, who was appointed the Minister of Economic Development and Trade of Russia on September 24th, 2007. She is an ethnic Tatar and was born in 1963 in Bashkortostan. In 1986 she graduated from the Moscow State University faculty of economics, where she received her PhD in economics. She studied economics there along with many of the economists who formed the intellectual backbone of liberal economic reforms in Russia. In 1992-1994 Nabiullina worked as leading specialist and consultant in economic policy, Russian Union of Industrialists and Entrepreneurs. In 1994-1997 she held senior positions at the Department of Economic Reforms, Ministry of Economics, in 1997-1998 was promoted to the Deputy Economics Minister. In 1998-1999 - Deputy Chairman of the Board, Promtorgbank, and Executive Director, Eurasian Ratings Service. 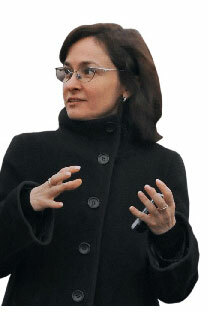 In 2000-2003 Nabiullina - First Deputy Minister for Economic Development and Trade. In 2005-2007 - head of expert council on National Projects. In May 2007 she was named Yale World Fellow. As a new Minister of Economic Development and Trade of Russia Elvira Nabiullina replaced German Gref, who has been considered a progressive reformer for Russia's economy with liberal views.